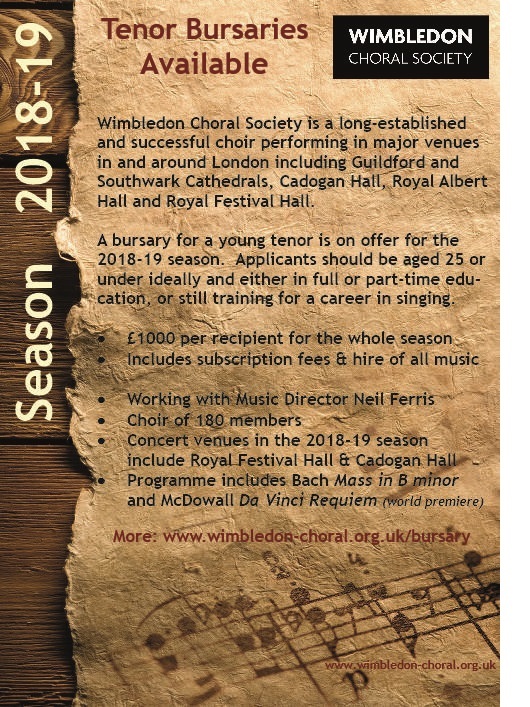 Wimbledon Choral Society (“WCS”) is a successful and long-established choir that is fortunate to benefit from a strong membership covering a wide age range including those in their 20s and drawn mainly from the local population. WCS has www.hollywatch.me an enviable reputation for performing concerts of professional quality in venues ranging from local churches in the Wimbledon area to large cathedrals like Guildford and Southwark to national concert halls such as Cadogan Hall, the Royal Festival Hall and the Royal Albert Hall. It is also invited regularly to participate in other events, examples of which in recent years have included BBC TV’s Songs of Praise, the Royal British Legion’s Festival of Remembrance in the Royal Albert Hall and has even sung at rugby league matches in Wembley Stadium. The choir seeks to encourage young singers to experience and maintain the enjoyment of choral singing by sharing with them an extensive repertoire of choral music and styles which, it is hoped, will remain with them throughout their later lives and which will retain the tradition and art of choral singing in the future. It believes that the diversity of opportunities offered by WCS may be attractive to young singers. The management committee of the choir has decided the most appropriate way of doing this is through the means of a bursary scheme. The scheme has been running successfully for several years. For the 2018-19 season it is open to a tenor who would like to work with us. Please click on the flyer shown left to learn more about this scheme and then click here for details on how and where to apply if you might be interested. The season is particularly exciting as it includes the world premiere of the WCS-commissioned Da Vinci Requiem written by Cecilia McDowall in the Royal Festival Hall in May 2019.